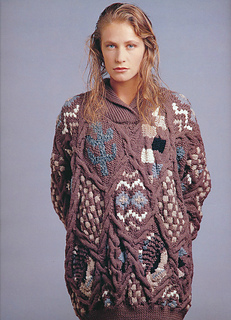 The Apache design comes as a sweater or a cardigan. The design is based around cabled diagonal/diamonds with texture and colour designs inside the diamonds. - Based on a stocking stitch tension of 10 stitches and 14 rows to 5 cm (2”) one repeat of the pattern (42sts) will measure 15cm (6”) wide and 84 rows will measure 30cm (12”) in depth.